The Alumni Association’s Sections Program currently boasts 54 sections around the globe, and getting connected is only a click away (minesalumni.com/sections). Each section is led by an alumni volunteer, or group of volunteers, who serve as ambassadors and event leaders for their local Mines community. By keeping local alumni connected to the school and to one another, staying informed about the latest campus news, and leading the charge in planning events and programs that make the alumni network vibrant, these volunteers extend the reach of the Alumni Association. E?Days celebrations, new student send?off parties, networking luncheons, professional development opportunities, lectures/receptions with visiting faculty, community service projects, holiday gatherings, athletic events and tailgate parties, happy hour get?togethers, and other events make for a busy calendar. Although the Alumni Association has focused on establishing sections in cities with at least 100 alumni, it certainly doesn’t discourage cities with smaller alumni populations from participating in the program (let’s hear it for our alumni in Paris and Perth). Mines alumni in The Woodlands, Texas, proudly sported their Mines bandanas at a happy hour gathering in January. Mines alumni in Spokane/Coeur d’Alene gather for E-Days ‘Round the World 2014. Mines alumni in Albuquerque display the Mines banner at E-Days ‘Round the World 2014. Denver Metro alumni head for the hills on a hike to the summit of Mt. Bierstadt in Colorado. For a complete list of sections, visit minesalumni.com/sections. If you are interested in getting involved with your local section, or if you’d like to get one started in your area, we’d love to hear from you. 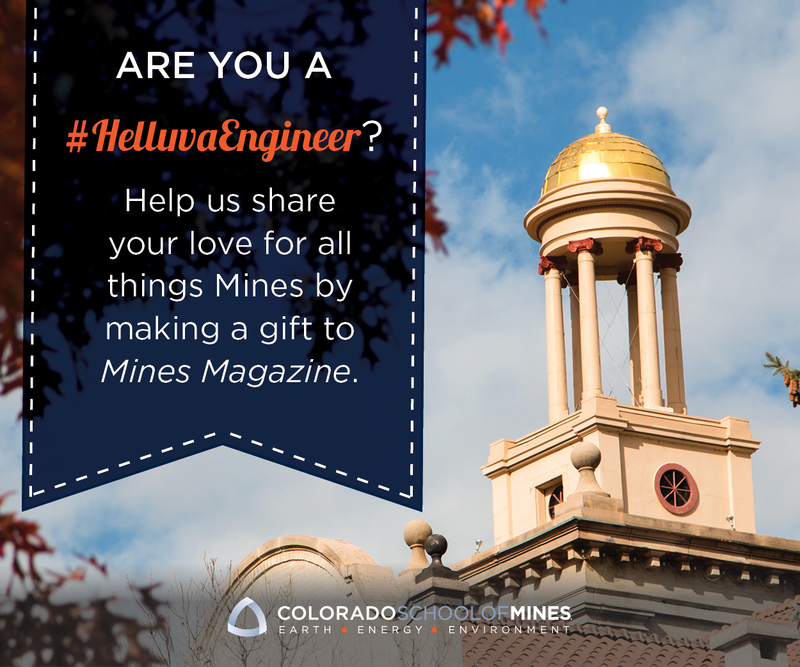 Contact the CSMAA office at 303.384.2143 or email [email protected] Celebrate your Mines pride! The Colorado School of Mines Alumni Association gratefully acknowledges donors who contributed $500 or more (above and beyond their membership dues) between January 1 and December 31, 2014. To make a contribution or to learn more, please click here.